SCVHistory.com LW2959 | Agua Dulce | Montie Montana Drives Mudwagon Near Vasquez Rocks, 1970s-1980s. 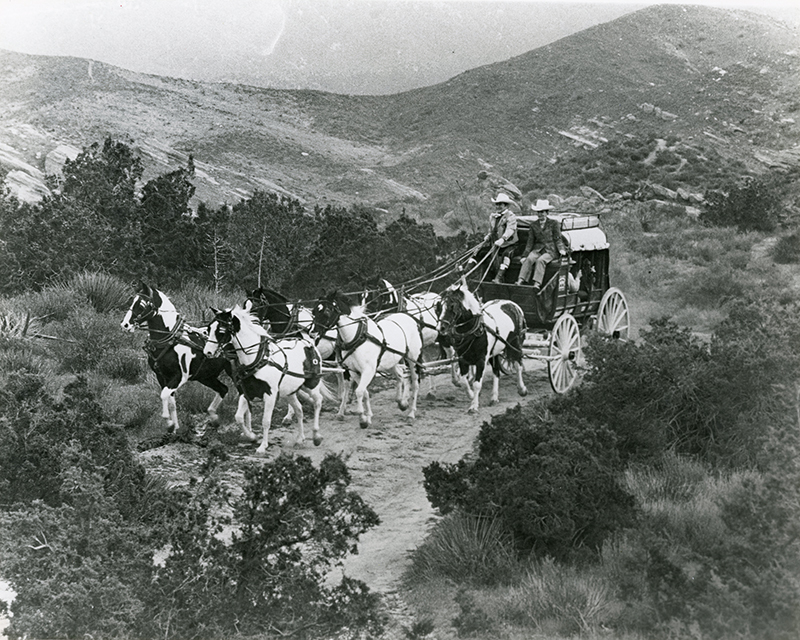 Entertainer Montie Montana drives a team of six paint ponies pulling his signature red mudwagon (which once belonged to Ed Bohlin) near Vasquez Rocks County Park. Montie's ranch was located on the flatland across from Vasquez Rocks, on the north side of Escondido Canyon Road at Agua Dulce Canyon Road. Undated 8x10 photograph; ex-Butterfields, ex-EarthHunt. The mudwagon's body painted red and black and inscribed on the sides "Montie Montana/MM" and "Sunlight Basin, Mont.-Cody, Wyo." Axles marked "Concord Express." Interior of wheel hobs serial numbered 510224. Yellow-painted undercarriage and wheels. Undercarriage with special hook, used to attach logs which acted as a braking device on long downhill grades. Canvas top with black, wrought iron rack. Brown leather boot. Black naugahyde upholstery. Together with four-horse harness and steel transport trailer built by Borg especially for the coach. Condition: Showing numerous restorations, considerable wear and chipping to paint. This coach has been painted numerous times, the last time in red by Montie in 1981. Note: This coach was purchased by Hollywood silversmith Edward H. Bohlin in Cody, Wyoming, in the 1930s. It was purchased from him by Weber's Bread and from them by Montie Montana in 1945. It was used by Montie for numerous appearances and Rose parades and ridden by many celebrities including John Wayne, Prince Phillip, Joe Montana, country singer Patsy Montana and Sons of the Pioneers. 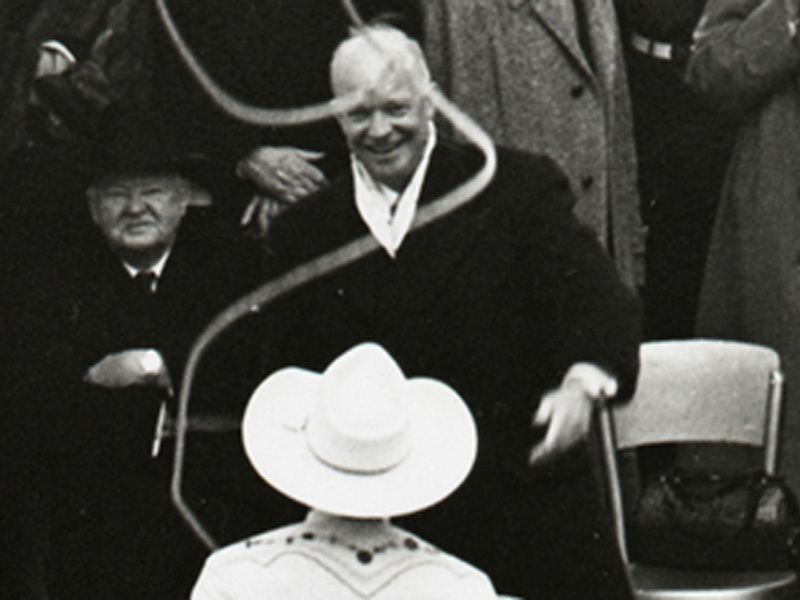 Between 1945 and 1965 Montie appeared with this stage coach before 8,000,000 school children. Though not bearing the usual markings, it was, by repute, originally used on the run between Sunlight Basin, Montana, and Cody, Wyoming. LW2959: 9600 dpi jpeg from original photograph purchased 2017 by Leon Worden.